Openherd: Two Hearts Alpaca Ranch - Alpaca product and service supplier located in La Vernia, Texas owned by Harriet & Chick Neubauer. Two hearts Alpaca Ranch produces top quality Alpaca fiber. 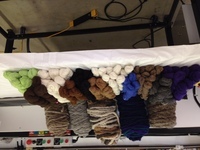 Our inventory consists of yarns, rug yarn, felt, and roving. We guarantee the quality and authenticity of these all natural products.